Birth Control: Latest Collision Between Individual Conscience And Society : Shots - Health News The current controversy over insurance coverage of contraceptives is the latest chapter in the long and often bitter history of conflicts between the right to follow one's conscience and the demands of society. 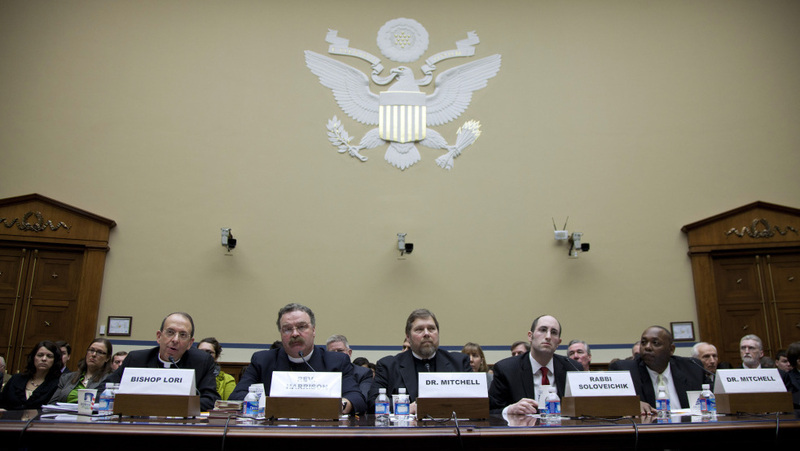 A House panel heard testimony about conscience and religious freedom Thursday from (left) Rev. William E. Lori, Catholic Bishop of Bridgeport, Conn.; Rev. Dr. Matthew C. Harrison, president, The Lutheran Church Missouri Synod; C. Ben Mitchell, Union University; Rabbi Meir Soloveichik, Yeshiva University; and Craig Mitchell, Southwestern Baptist Theological Seminary. President Obama's controversial decision to require Catholic employers to provide free contraceptives to their employees is still reverberating. A new New York Times/CBS News poll out this week shows 60 percent of the public supports the president, including 58 percent of all Catholics. But the leadership of the Catholic church is still mobilizing to increase opposition, and the issue remains a politically sensitive dilemma for the president. Republicans in Congress are trying to reverse the decision. And on Thursday, a House committee heard representatives from groups representing some Catholics, Jews, Lutherans, Baptists and others upset that the decision was infringing on their religious freedom. "Not only is this an outrageous violation of one denomination's religious freedom, but it's quite frightening to those of us of other religious denominations," said Rabbi Meir Soloveichik of Yeshiva University. Democrats and other critics protested the hearing because initially, the witnesses only included men. Two women testified in a later panel. The current controversy over insurance coverage of contraceptives is the latest chapter in the long and often bitter history of conflicts between the right to follow one's conscience and the demands of society. The idea of respecting personal, moral or religious beliefs goes back to the days of Thomas Jefferson, James Madison and Alexander Hamilton. "There are plenty of statements from the founding fathers saying that rights of conscience, 'We don't submit those to government,' " said Tom Berg of the University of St. Thomas in Minneapolis. "If you look at the time of the framing of the First Amendment, there's a lot of talk about conscience rights during the founding period." So the right to be guided by one's conscience became one of the nation's most important values, especially during some of the hardest times, such as the Vietnam War. During the war, the "right of conscience" became the focus of intense debate as draftees claimed conscientious objections to the war. The right to object to a medical procedure based on one's conscience didn't become a really big issue until 1973. That's when the Supreme Court legalized abortion in the landmark Roe vs. Wade case. The decision was a legal and cultural milestone. But lots of doctors and nurses were horrified that they might be forced to perform abortions. So almost immediately, states started passing "conscience clause" laws to protect them. Congress passed laws, too. The so-called Church Amendment protects doctors and nurses who don't want to do abortions or sterilizations, or even have to learn how to do them. The Coats Amedment is designed to protect medical students from being forced to learn how to do abortions. The Weldon Amendment bars discriminate against anyone or any group that won't perform abortions, pay for abortions, or refer patients for abortions. The Civil Rights Act requires employers to try to accommodate religious objections. But in more recent years, the debate began shifting from abortion to contraception — especially after the Food and Drug Administration approved Plan B, a morning-after pill. To some, Plan B blurred the line between abortion and birth control. There's debate about whether the drug could prevent a fertilized egg from implanting in the womb. Pharmacists started turning away women trying to fill their prescriptions. Some states started requiring health workers to honor all prescriptions. Others passed laws to protect those who refused. "I think you've seen sort of a metastases of conscience objections in some ways. You know, an ambulance driver saying: 'I don't want to transport this patient,' if they know that the patient is on the way to the hospital for an abortion," said Robin Wilson of Washington and Lee University. "We've had nurses, for example, saying, 'I don't want to participate in the circumcision of infants.' "
Some doctors have refused to do fertility treatments for single women or gay people. Others won't withdraw care at the end of life. Many will have nothing to do with lethal injection executions. As President George W. Bush was leaving office, he ordered new protections for health care workers that were welcomed among advocates concerned about religious persecution. "The regulation was so important because it said not only for abortion and sterilization but any type of health care procedure that you could not coerce health care professionals to participate, and that included any health care professional. Many of the laws on the books only protect doctors," said David Stevens of the Christian Medical & Dental Associations. But the rule started another huge controversy. Critics charged it would create dangerous new barriers to patients obtaining crucial, sometimes life-saving care by allowing essentially any health care worker to object to any care they objected to. "It would do things like give hospitals a free pass if they denied emergency abortion care to a woman who was literally dying for need of the care," said Jennifer Dalven of the ACLU's Reproductive Freedom Project. When President Obama took office, one of the first things he did was rescind most of the Bush regulation. Then, the federal health overhaul law raised new questions about conscience protections. This time the question was whether institutions — not just individuals — have a "right of conscience." "I don't believe that institutions have consciences in the real sense of having a conscience. I think a better way to look at it is institutions are venues for conscience," said Robert Vischer of the University of St. Thomas. "I think the lifeblood of individual conscience is this rich tapestry of morally distinct institutions ... and as venues for conscience they still need protection." Many experts think more conflicts over conscience are likely to occur in the future. "It can affect a lot of things, from physician-assisted suicide, human cloning, embryonic-stem-cell research if that's successful," Stevens said. "There's a whole host of things coming along in health care where people may have either moral, ethical or religious conscience concerns about participating."